We occasionally have pedigree cats (but very rarely kittens) for rehoming. Many pedigree cats are easy to look after, but some, such as Persians, need a bit of experience, so are best suited to people who have had cats before. 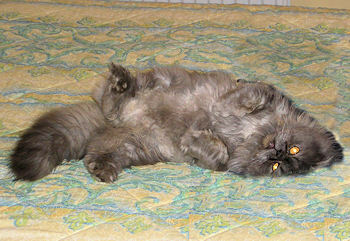 Persians need to be groomed every day or two, which usually isn't difficult and takes only a few minutes - if this isn't done the coat can get out of hand, though. Long-term neglect can result in coats so tangled that they need to be shaved off, and we have seen badly knotted coats that have caused deformed spines. Persians also have a tendency to sneeze a lot, need frequent eye cleaning and need a careful watch over their teeth. This isn't a major issue, though, and keeping pedigree cats can be very rewarding. Contrary to popular belief, most pedigrees are happy to go out, just like non-pedigrees.